Are Crosby and Jasmine Together on Parenthood? 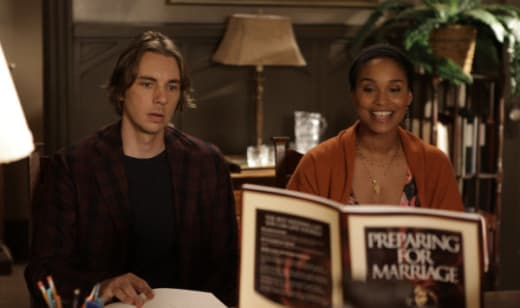 Based on one of the final frames of Season 2, showing Crosby (Dax Shepard) and Jasmine (Joy Bryant) talking and laughing together inside the house be bought specifically to win her back, you'd think a full-fledged reconciliation was imminent. "When we start this season, things have not worked out between them the way people might have thought from that image," executive producer Jason Katims tells TV Guide. "They're not at war, but they're not together at the beginning of the season." The decision to keep the pair apart for at least part of Season 3 stems from a desire to explore co-parenting when parents are not together, Katims says. "We're always looking for new ways on the show to explore the kind of things that are relevant to parenthood today that we might not have explored," he says. "We want to explore the idea of Jasmine and Crosby living separately, trying to go on with their lives individually, but wanting to both be there for their son." It looks like this arc won't be too short-lived, either. Not only have some Parenthood Season 3 spoilers have hinted at a brief fling for Crosby, the series is also currently casting a new love interest for Jasmine. Dr. Joseph Prestidge is described as a handsome, charming (and slightly older) pediatrician and author who asks Jasmine out after treating Jabbar for allergies. The character will appear in at least four episodes this season. Speaking of Parenthood love interests, Mark Cyr (Jason Ritter) returns: "In the first episode, Sarah is going to be at the high school having a heated argument with an administrator at the high school that Jason Ritter witnesses," Katims says. "So she re-meets him in sort of an embarrassing moment. She's going through something else in the episode and winds up talking to him and they reconnect." "We've had really interesting and great love interests for Sarah over the first two seasons, but we really wanted to do a story where we get her into a long-term relationship, or at least a longer-term relationship," Katims says. "Of course, we need to see the practical matters of how many episodes we'll be able to have Jason Ritter with us, but he will definitely have a more extended role."